These foam bananas will leave your audience roaring with laughter! Turn one banana to two bananas. A great finish for any sponge prop act, the foam banana is definitely a crowd-pleaser. This new medium sponge bananas set contains two medium sized sponge bananas that are perfect compliments to Alan Wong's full size sponge bananas, or used separately for all your favorite sponge routines. You can multiply them in the hands of small children and watch them go wild! Comes with basic routine and instructions, contained in a durable zippered nylon bag as the practical working professionals would pack them. 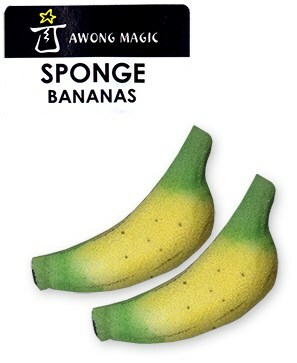 Like all sponge products in Alan's line, each sponge banana was handmade and painted with great patience and care. Comes with two foam bananas.